Figuring out where you will fall into these statistics and whether your STR could make you money or not is important to determine prior to investing funds. Here is a good way to help make that determination. 1. Is your area strongly seasonal? You may be booked close to 100% some months and not booked at all other months. Winter ski resort and summer beach towns are excellent examples of this type of rental. 2. Is your home in a high demand area such as close to tourist destinations, a major university or other draw? 3. How big and nice is the home? Inexpensive one-room rentals will rent more often than high-end, several hundred dollar per night houses. One of my clients has two homes. One is a two bedroom, one bath and rents for $65 per night. It stays booked about 90% of the time. Their second home is a three bedroom, two bath, that rents for $125 per night, however it stays booked only about 70% of the time. 4. Do you have a unique home such as a tree house or castle? Browse to www.tripadvisor.com, www.airbnb.com, and www.homeaway.com. Pull up your city in each of these websites and add in filters to match your specific rental such as location within one mile (closer is better if there are enough comparable properties), number of bedrooms, number of bathrooms and number of people allowed. Be sure to leave the dates blank to get the most complete sample of homes. 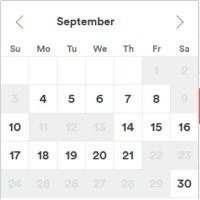 Review the calendars of each home noting how many days are booked in the upcoming three months. 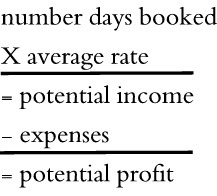 Average these dates to get a round number of the potential bookings per month. While determining the number of days your future competition is booked take note of the rates they are charging. Average the rates together to determine a good rate that you may be able to charge. Now, take the number of potential rent days in a month and multiply it by the averaged rate you calculated. This gives you an estimated monthly gross income. Next we need to determine your cost of operating your STR. First, calculate all of the expenses involved in operating your home. If you plan on renting a room then this step is fairly easy. Take the square footage of your rental room and divide it by the total square footage of the house. Take this percentage and apply it to an average of all of your monthly bills, mortgage, insurance, etc. then add up all of those costs to determine your final expense. Preferably use twelve months of bills to determine your average. Calculating the expense of an entire home is similar, but if this home is fully a rental then simply take 100% of all of the monthly bills for the past six to twelve months and determine an average of the total bill costs. Add the taxes and insurance and any other bills that are paid once per year to get a complete average cost. 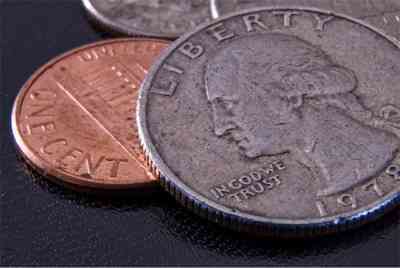 You may also need to include the cost of a business license or other regulatory fees. The third step in the process is to determine the extra costs involved with the operation of an STR specifically. This is where we add in cleaning costs (or cost of supplies if you plan to clean yourself), laundry cost, food, gifts and miscellaneous costs such as replacing damaged items like sheets and towels. Cleaning costs are only one time after each rental, but will cost you much more over time if the home is rented with a minimum one night stay versus two or more night stay minimums. If your town is a tourist town then average night stays will be longer than a town where people are mostly passing through. In our experience about 60% one-night stays are average for a mixed use city. Now that we have estimated your monthly gross income as well as expenses, simply subtract the two numbers and that will give yous an estimated profit or loss. Although the number is an estimate it should give you a pretty good idea if this opportunity is going to be a good match for your home. If you need help determining a potential profit feel free to contact us for additional information or help.